Ross Keymer blasted 146 for Ufford Park against Saffron Walden. Ramsey lost for the first time in Cambs Division One today (May 28) and they face a huge challenge to stay on top on Monday (May 31) when they host second-placed Wisbech. And Wisbech will go into that crunch meeting in better spirits as they crushed reigning champions Godmanchester by eight wickets today (May 28) as Ramsey were losing for the first time this summer by three runs at Foxton. Tommy Howgego cracked 38 for March against Warboys. Wisbech skittled Godmanchester for just 90 with Paul Edgeller (4-19), Gary Freear (3-18) and Jamie Gollands (2-2) the men in form with the ball. Captain Sam Albutt (37) gave the Wisbech innings a flying start before Josh Bowers (30no) saw them home early in the afternoon. Ramsey made a spirited effort to get past Foxton’s 229-8, but despite a half century from James Markland and decent runs from Taylor West (45) and Michael Cafferkey (43) they couldn’t quite get home. It was a first defeat for Ramsey after five straight wins. Aussie Adam McDermott helped Nassington up to fourth place with a blistering innings at bottom club Burwell seconds. McDermott smacked 121 from just 68 balls as Nassington piled up 290. He struck six sixes and 16 fours. Burwell were dismissed for just 160 in reply with Conor Craig claiming 5-34. Brother Harrison Craig, who makes his Minor Counties Championship debut at the age of 16 tomorrow (May 29), bowled just four overs and took one wicket. Ketton skipper Rob Vitas reckons his side played a relegation six-pointer at Waresley so he was thrilled with an eight-wicket win after the hosts had set a respectable 50-over target of 205-8. Pete Rowe, a Kiwi signed from Hunts League side Hampton CC in the close season, contributed his best Ketton score of 91, while Shakir Mahmood was unbeaten on 57 when victory was completed. Ulrich Van Duyker (3-42) returned the best bowling figures for Ketton, but Dan Cotton’s spell of 10-6-13-1 was described as ‘sheer class’ by his captain. March won a huge game in their bid to return to the top flight at the first attempt. Visitors Warboys started the day on top of Division Two and looked set to stay there after amassing 260-8. Matt Cooksey and Matt Duncan added 103 for the fifth wicket for Warboys. But Aussie import Sam Freedman struck 65 from 61 balls for March and James Harradine weighed in with 55 as March got home with 10 balls to spare. March are now second in the table, one point behind new leaders St Ives. 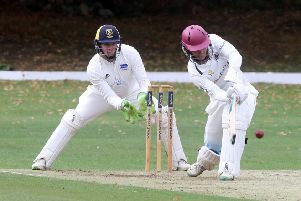 At the other end of the table Ross Keymer blasted Ufford Park out of the relegation zone with a brilliant innings of 146 in a 76-run win over Saffron Walden seconds. Keymer’s knock included four sixes and 18 fours. Ufford are now a point clear of the bottom three and a point behind Newborough who were beaten by five wickets at home to Kimbolton. David Cooper continued his free-scoring summer with 87 for Newborough as they recovered from 42-4 to 195, but Kimbolton always looked likely winners once import Rubin Claasen (69) found his stride. There is a full programme of Cambs League fixtures on Monday. They are listed below today’s results. Nassington 290 (A. McDermott 121, A. Bandarnaike 56, A. Laud 24, A. Morris 23). Burwell 160 (D. Jones 30, C. Craig 5-34, J. Pope 3-27). Ramsey 226-7 (J. Markland 55, T. West 45, M. Cafferkey 43). Godmanchester 90 (P. Swannell 24, P. Edgeller 4-19, G. Freear 3-18, J. Gollands 2-2). Wisbech 91-2 (S. Albutt 37, J. Bowers 30no). Waresley 205-8 (U. Van Duyker 3-42). Ketton 206-2 (P. Rowe 91, S. Mahmood 57no, A. Rodgers 46). Warboys 260-8 (M. Duncan 78, M. Cooksey 46, J. Trafford 24, J. Skidmore 21, A. Grange 20, T. Phillips 2-39, A. Wright 2-45, S. Freedman 2-68). March 261-6 (S. Freedman 65, J. Harradine 55, T. Howgego 38, B. Phillips 34, R. Tombs 20. J. Trafford 2-40). Newborough 195 (D. Cooper 87, A. Dair 27). Kimbolton 196-5 (R. Claassen 69, H, Duberly 58no, A. Dair 2-36). Ufford Park 277-7 (R. Keymer 146, T. Hart 51). Saffron Walden 201-9 (J. Beace 49, T. Hart 3-12).